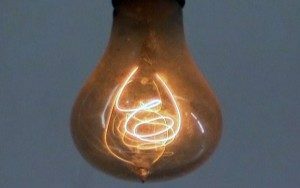 CLC Bulbs » Blog Archive » Amazing 117 year old Light bulb still burning bright for fire fighters. Amazing 117 year old Light bulb still burning bright for fire fighters. Worlds longest burning light bulb still providing light for the fire fighters of Fire Station 6 in Livermore, California. This hand blown carbon filament Shelby bulb was first used by the fire department in 1901. Today it can be seen live on the Livermore Bulbcam.